In this season of controversy over the place of Islam in America, two women named Muhammad won Olympic medals for the United States. Last week, Ibtihaj Muhammad, famous for being the first U.S. Olympian to compete in a hijab hair covering, won bronze in the team saber fencing competition. On Thursday night, Dalilah Muhammad took gold in the women’s 400-meter hurdles, winning in 53.13 seconds. Both women competed in Rio de Janeiro with their names right above “USA” on their uniforms. It was a notable counterpoint to statements by some Republicans, including presidential candidate Donald Trump, who proposed various temporary bans or restrictions on Muslim immigration. “I’m born and raised here, so I’ve been here from the start,” said Dalilah Muhammad, a New York City native whose parents are African-American. There are about 3.3 million Muslims living in the United States, according to a 2015 Pew Research Center poll. Muslim organizations count about 6 million members, a third of them African-American. 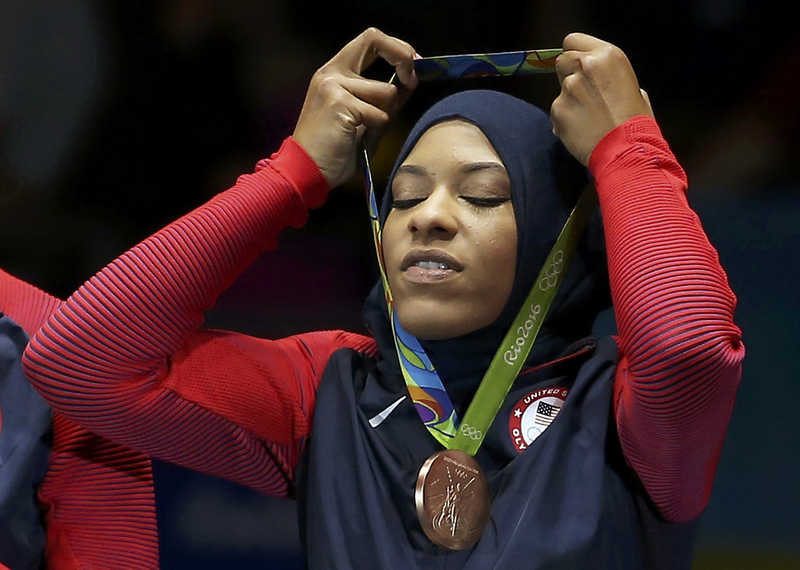 Ibtihaj Muhammad of the United States celebrates winning the bronze medal. The history of American Muslims and the Olympics probably starts with Cassius Clay, who won boxing gold at the 1960 Games, then converted to Islam and changed his name to Muhammad Ali a few years later. Ali memorably lit the torch at the opening ceremonies for the 1996 Olympics in Atlanta. An email to the United States Olympic Committee asking about other Muslim Olympians was not returned Friday. Trump’s proposals resonate with a sizable chunk of America. About one-third of respondents in a recent poll agreed with his plan to temporarily ban Muslims from entering the United States. Ibtihaj Muhammad also was born in the United States to African-American Muslim parents. Unlike the hurdler, she wears a hijab favored by segments of the Muslim community. The two Muhammads did that just by winning.